By Sam Smith | 10.7.2015 | 7:10 p.m.
No one called it Freddie-ball yet. But the Bulls Tuesday seemed to be having a ball in a 105-95 preseason opening win over the Milwaukee Bucks. 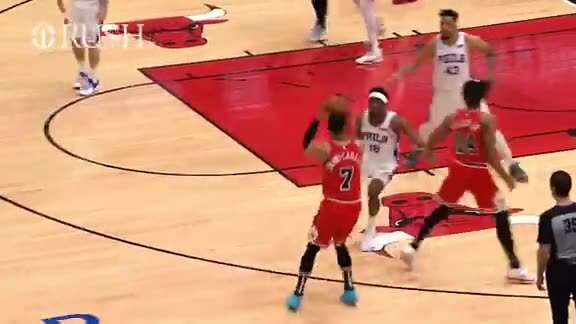 “You’ve got the freedom to shoot it when you are open,” said Jimmy Butler, who had 23 points in 25 minutes and was matched by Doug McDermott with 23 points, McDermott’s all after halftime. Nikola Mirotic added 18 points as the Bulls were 13 for 39 on threes, more threes attempted than in any game last season. The Bulls also attempted 99 shots, just short of last season’s most, which Tuesday was 22 more than Milwaukee’s as the Bulls dominated the backboards even with their perimeter emphasis and had 24 offensive rebounds. The shots were quick and frequent as the Bulls scored 68 second half points to pull away even with Derrick Rose, Mike Dunleavy, Pau Gasol, Taj Gibson and Kirk Hinrich all out with injuries or rest. What Hoiberg saw was a motivated and aggressive Butler, who in emphasizing his embrace of a leadership role this season engaged in a duel with Bucks forward Khris Middleton and found the floor several times and led the team with six assists. Hoiberg also saw McDermott finally settle down and make shots, five of eight threes in the second half, and an impressive debut from rookie Bobby Portis, who was as pugnacious as promised with a game high 14 rebounds, seven offensive. “Obviously, once we get Pau out there we’ll have a little more post presence,” Hoiberg noted. “Doug got it going in the second half, which was great to see. The great thing about Doug is he was zero for five at halftime and for him to come out and continue to shoot was a great sign; he might have put his head down a little bit in the past. But he kept his confidence. He’s one of those guys, shoots 100 threes in practice and very rarely makes less than 90 of them. When he shoots you expect him to make it. “(Jimmy) was making plays,” noted Hoiberg about Butler adapting more as a playmaker as well. “I thought he got guys great looks. He does things you just can’t teach, those fadeaways, shooting one leg runners; he’s got so many things in his arsenal, so many things he’s worked on. Had six assists and that could easily have been double figures. It was a positive small first step for Hoiberg and the Bulls, who now head for Colorado Thursday to play Denver and Canada Saturday to meet Minnesota. Butler, Mirotic, Tony Snell, Joakim Noah and E’Twaun Moore started Tuesday. Hoiberg said he’ll play different starting lineups until the last few games of the preseason and will start McDermott for Snell Thursday. Gasol probably will play some as well. Hoiberg said Rose’s eye remains mostly closed after surgery, but Rose should join the team on its return next week and practice shortly thereafter. It was a fairly desultory first half with Milwaukee leading 40-37. The Bulls were three of 20 on threes and shooting 28 percent overall with Butler doing most of the heavy lifting. But it was more inaccurate shooting than a slow pace. Hoiberg had promised an offense with greater abandon, and it was clear quickly the Bulls had abandoned their style of previous years. There were few called plays in a slow pace. Instead, the ball moved with alacrity, especially after Bucks’ turnovers. Shots were taken more quickly as Hoiberg emphasized taking the first good shot available. No Hoosiers offense for this Bulls team even though Hoiberg started his NBA career playing in Indiana. The Bulls then pulled away in a wide open third quarter when the threes started landing as McDermott and Aaron Brooks combined for five in the quarter. The preseason, especially with so many regulars out, is an opportunity for players to make a claim for playing time. "I’m a dog out there; I’m not someone who is going to let someone (intimidate) me." Portis did with spirited combat on the boards against veterans like Greg Monroe. Rashad Vaughn led Milwaukee with 20 points as Jabari Parker didn’t play. The Bucks principal starters all played fewer than 20 minutes. But Portis several times went over box outs for rebounds and even threw an elbow at Monroe during a skirmish. Mirotic showed a familiar, hustling game, clever body movements getting him to the line for 10 free throws. But he was one of five on threes, and pump faking away a few that Hoiberg said he should shoot. There aren’t going to be many shot clock violations for this Bulls team that was among the league leaders in that category the last few seasons. Perhaps a surprise was Cameron Bairstow with a pair of blocks and seven rebounds in just under 17 minutes. He also was loose shooting two of 11, but he showed a mettle no one saw last season. Similarly with McDermott, who obviously was tight early but shot himself out of it. Noah had one point in 20 minutes, but had seven offensive rebounds and seemed to move well. Snell again seemed to have difficultly finding a spot in the game, often disappearing for long stretches and had seven points in 31 minutes. Brooks was pesky in drawing a pair of charges stepping in front of lumbering Bucks big men. The dominant Bull, though, was Butler, who challenged Bucks at the rim and went through them, found teammates with his drive and kick play, which Hoiberg seemed to emphasize with the ball movement, and aggressively looked to play an inspirational role for the team. “Jimmy, he wants to assume that role, like Kevin Garnett, Michael Jordan, pulling everyone with him with leadership,” said Hoiberg. “Getting guys in the gym. He had Doug with him for a couple of weeks this summer. That’s a testament to what he wants to do as far as team goals. When you have a guy like that who is one of the best players in the league who always works the hardest (it emboldens a team). Butler took an enhanced role Tuesday with presumed starters Gasol, Rose and Dunleavy out. But it’s a role Butler said he’s ready to embrace. “With so many players we had out tonight I had to be the aggressor from start to end,” said Butler. “I think we have a good enough team to score. Doug’s a shooter, so someone has to help to get him his open shot. I think we did a great job finding open guys tonight and a lot was because everyone was aggressive.